The adventure continues this month in the pages of Sheena: Queen Of The Jungle. Dynamite Entertainment brings the fun back to newsstands next week with the fourth issue in this exciting series from Marguerite Bennett, Christina Trujillo and artist Moritat. Sheena finds herself trapped in a sacred temple with nightmarish creatures known as Face Stealers, and is forced to use all her cunning to escape their razor sharp teeth. Meanwhile, the mercenaries return to the village demanding their man be returned. However, when it is discovered that Sheena has yet to return from her search, the small army prepares to burn the village to the ground. Just as tensions appear to escalate beyond return, Sheena and Chano return to deliver the disappointing news to Cadwell's army - their man is dead, killed by creatures thought to be nothing more than myth and legend. Unsatisfied with this answer, the men turn their attention back to destroying Sheena's people, forcing her to offer up a bargaining chip - access to untold riches through the Temple Of The First People. Their greed piqued, Cadwell's men agree to spare the village for the time being, but bring Sheena and Chano along as insurance. As they trek through the Amazon, the small group takes a minute to stop off at an excavation site where a mysterious sarcophagus has been unearthed, an ancient tomb containing a hive worth of the vile Face Stealers. Of course, the mercenaries don't heed Sheena's warning, dismissing it as nothing more than the silly superstition of a primitive people - at least until one of the unsuspecting soldiers is attacked and killed by two of the abominations. The remaining men turn their weapons on the creatures and prepare to fire, just as the work crew damages the ancient tomb and spews forth an army of the deadly undead creatures. Where does our heroine go from here? We'll have to wait and see! 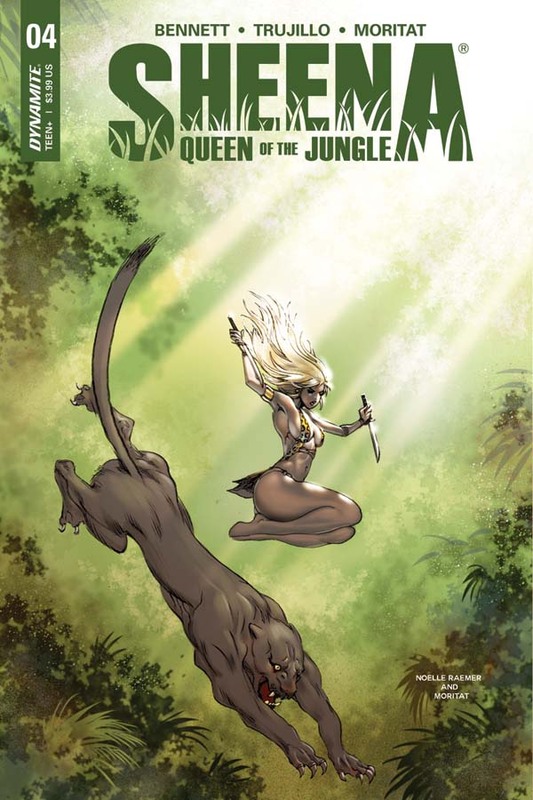 Sheena: Queen Of The Jungle #4 takes the mythos of the famed heroine and throws in a dash of The Walking Dead in a pulse-pounding adventure that turns everything up on its head. It's a white-knuckle thrill ride that mixes adventure and horror into a aesthetically pleasing manner that is a joy from start to finish! If you haven't been reading the new series yet, this one is for you! Rating: 5/5 - "The latest issue of Sheena: Queen Of The Jungle mixes adventure and horror into an aesthetically pleasing tale that turns the Sheena mythos on its head." 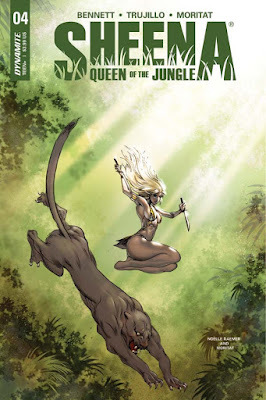 Sheena: Queen Of The Jungle #4 arrives on newsstands Wednesday, December 13th.